People watch a news report about the planned Trump-Kim meeting at a railway station in Seoul on March 9, 2018. It was 5 p.m. on Thursday, and Beltway denizens were starting to think about braving the commute, heading out for a drink, or even packing for spring break with the kids. Then news flashed across Twitter: South Korea would be making a statement from the White House at 7 p.m. President Trump popped into the White House briefing room himself to tease that it would be a “major” announcement “on the big subject.” He wasn’t exaggerating: we soon learned South Korea’s national-security adviser had brought an offer of a summit between Trump and North Korean leader Kim Jong-un – and the White House had accepted. From the avalanche of national security and political analysis that followed, here are eight things to know. We’re all well aware that the cycle of provocations surrounding the Korean Peninsula could have nuclear consequences, and the potential for miscommunication is high. This situation needs to be defused by direct talks between the North and the U.S. Any period of time where the North isn’t testing is a period where misunderstandings are less likely. And our South Korean allies very much want us to ramp down the tension and to talk to Kim. Their views matter, since their citizens already live under daily threat, regardless of whether the North can deliver a nuclear missile to the U.S. 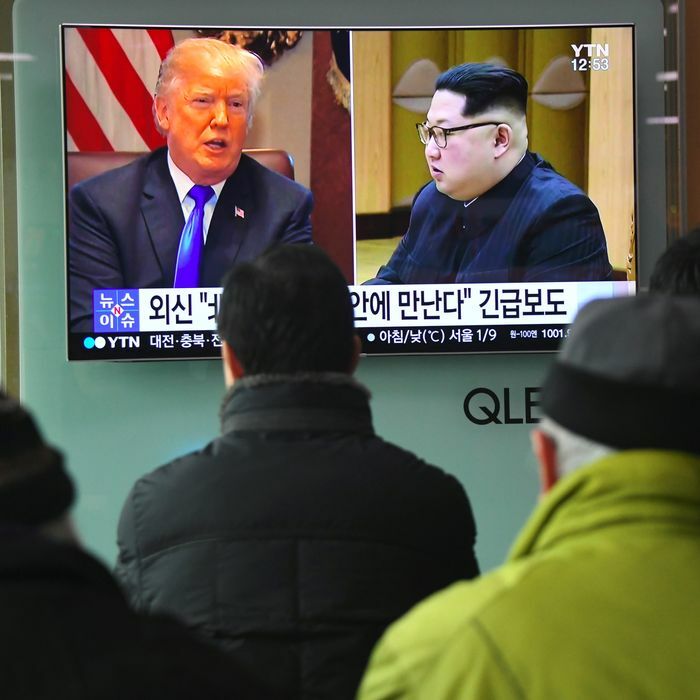 Within an hour of the announcement at the White House, unnamed officials were telling reporters that while the North Korean concessions were real, the U.S. was “not prepared to reward North Korea in exchange for talks.” Washington and Pyongyang have gotten close before and no one should be surprised if this latest effort to address the North Korean nuclear crisis doesn’t yield a solution. In 2000, Bill Clinton’s advisers debated heatedly whether he should meet with the current Kim’s father, Kim Jong-il, as one of his valedictory foreign-policy trips. The skeptics won out. After the North sent an invitation to Clinton, Secretary of State Madeleine Albright was dispatched to Pyongyang, where she was received with much fanfare — yet, the two sides were unable to close a deal. It’s worth remembering part of the reason why: although Albright’s talks were constructive, she was savaged by critics for allowing Kim’s expert choreography to portray her relationship with the “Dear Leader” in too cozy a light, as he continued starving his citizens behind the scenes. This time, Kim Jong-un offered a moratorium on nuclear and missile tests “while talks are underway” and said North Korea will not object to the U.S. and South Korean military exercises due to be held on and around the Korean peninsula in the next few weeks. These two apparent concessions will help lower the temperature — and give the North the high ground. The Trump administration has a tremendously difficult task ahead. Can they maneuver adroitly enough that the North doesn’t walk away from the talks? And what happens if, as we’ve seen at several points during the tortured history of U.S.–North Korean diplomacy, Pyongyang accuses Washington of acting in bad faith, or acts in bad faith itself? Is the White House prepared to offer South Korea and the rest of the globe a convincing counter-message? Or his “B” team. Or, frankly, any team. Let’s review: Trump’s National Security Adviser H. R. McMaster did not appear with the South Korean national-security adviser to brief the press, something former Defense and National Security Council (NSC) official Kelly Magsamen believes has never happened since the NSC was created after World War II. And the rumor is that Trump has grown tired of McMaster and is planning to replace him between now and May. Pentagon staffers were telling reporters they didn’t know what was coming a few hours before the announcement. Secretary of State Rex Tillerson was on his way to Africa. And State, which would normally prepare such a summit, has vacancies in the top two positions dealing with Korea (assistant secretary for East Asia and ambassador to South Korea). The diplomatic envoy to the North just announced his retirement. Moments like these are why you need to maintain a talented and robust diplomatic corps. Trump may be showing spontaneity, but Kim Jong-un is not. Professor Elizabeth Saunders points out that summits are currency in international relations. The North views the lack of a permanent peace deal, and Washington’s insistence on treating it as a pariah rather than a respected member of the international community, as not just insults but threats to its existence. A U.S.–North Korean summit is a pinnacle of respectability, and thus a prize Pyongyang has sought for decades. A 1988 North Korean propaganda film, The Country I Saw, ends with an American president showing respect for North Korea’s nuclear and missile programs (just sketches and plans at the time) by dispatching an envoy to Pyongyang. It is worth noting that the North produced four sequels to this film. Jokes about the “bad hair, bad Twitter” summit started flying pretty quickly, but there is a serious point here. Both leaders rely on their personal “brand,” and on inspiring some combination of fear and reverence. Each shows great confidence that his supporters will accept anything he tells them — even if it seems to be a complete reversal of things he has said before. Each leader has calculated that a meeting — or the announcement of a meeting in the future — will make him look strong to his base and help him get more of the international attention he craves. But each leader is also used to playing a zero-sum, two-men-enter-the-ring-one-man-leaves style of diplomacy. This can’t end well for both of them. There’s probably already a hot take in print somewhere, or at least a tweet, about how this development proves that Trump’s fondness for unpredictability was the brilliant and tough diplomacy the Korea crisis has been waiting for. Madman theory says that if you can convince your opponents that you are irrational and not deterrable, they will make concessions to you. Interestingly, though, this theory has nothing to say about what happens when your opponents study the particular form of your madness and develop a strategy for how to play to your weaknesses. The Chinese and South Korean governments have already demonstrated considerable skill at using flattery to move Trump where they want him. At first glance, the North Korea news might seem totally unrelated, but from Kim Jong-un’s sister Kim Yo-jong to Ivanka Trump to White House press secretary Sarah Huckabee Sanders, women are playing all kinds of critical roles in this drama. And did you notice how many female experts I quoted in this piece? Seemed kind of normal, didn’t it? That’s what International Women’s Day is all about. Having helped shape and plan a failed presidential summit in 2000, followed by three years of violence from which Israeli-Palestinian relations have still not recovered, make sure you know what you’re doing. We didn’t. What does this mean? It looks like the sensitive and delicate pre-summit negotiations will be carried out in public. And a significant portion will be among parts of the U.S. government. Not a good sign.